It's sure to be a packed month. I'm busy finishing a polish on the manuscript for my debut novel, which I'm delivering to my agent after Labor Day. I'll be hunkering down for the next five days, staring at my computer screen with blurry eyes and swigging green tee by the pot. But there's nothing I'd rather be doing. Instead of sharing a recipe today, I wanted to post about the fabulous lunch that I had yesterday at Jinya Ramen in Studio City. A recent transplant from Japan, I consider this shop to have the best ramen in Los Angeles (I know, there's always a big debate raging about this). Yesterday, along with my friend/editor/literary guardian angel, I feasted on the spicy ramen, studded with spinach, spicy bean sprouts, and pork chasu. We both added a green salad and gyoza, which I adore. Although, we both had to take post-ramen naps, it was worth it! I think that ramen is the ultimate comfort food--filling, flavorful, warm, soupy, and budget friendly. In addition to Jinya Ramen, I also love their counterpart izakaya (Japanese pub) called Jinya Robata on 3rd Street in West Hollywood. In fact, I go there so often, that the manager and all the cooks know me well. 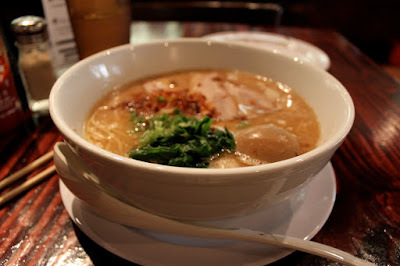 Here's the article I wrote on Jinya Ramen when they first opened.